You are here: Home / Red Shoe Movement Blog / Women Empowerment Articles / What is a CV? Wonder no more! When I talk with people who are looking for a new job, one of the questions I’m frequently asked is, “What is a CV?” It’s a term that is often heard among people looking for jobs, but not everyone knows what it means. And if you Google, “What is a CV,” you’ll find page after page after page of relevant answers to this question, because a lot of people find this a slightly confusing topic. 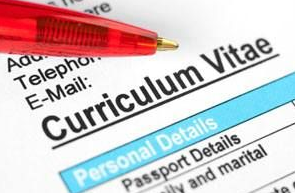 So then, what is a CV and what does CV stand for? 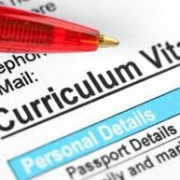 CV stands for curriculum vitae, which is Latin for “course of life.” The term CV is much more common outside the US, so if you’ve spent most of your life in the US, it isn’t a surprise that you find yourself wondering, “What is a CV and is it the same thing as a resume? Generally, in the US, a CV is similar to a resume, but it is quite a bit longer. It is usually used for academic, scientific, or research positions and, in addition to job information, it includes great detail about publications, presentations, honors, awards, grants and fellowships. What is a CV outside the U.S.? Countries other than the US generally use a CV as the job-search document of choice. And, in addition to a lot more details than in a US resume, a CV will usually include a headshot photo in the corner of the first page as well as personal details such as date of birth and visa status. 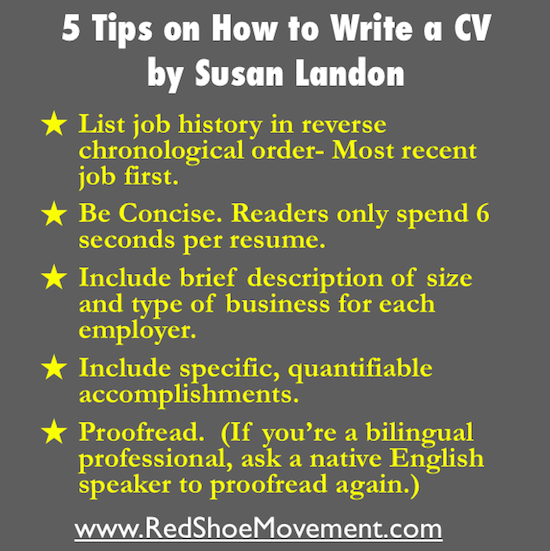 As a result CVs from other countries are usually much longer than American resumes. Do I Need to Know How to Write a CV? Now that you know just what is a CV, the question is, do you need to know how to write a CV? If you are looking for a job in the US, whether you currently live in the US or somewhere else, then you don’t really need to worry about how to write a CV. The important document for you is a resume. But even though there is a difference between a CV and a resume, most people in the US tend to use the terms interchangeably. 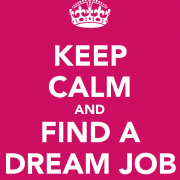 There are lots of articles about how to write a CV or resume. Since I’ve been an executive recruiter for over 20 years, and I can’t even begin to count the thousands and thousands of resumes I’ve read, I have my own list of important tips on how to write a CV or resume that will get you the attention that you deserve. List your job history in reverse chronological order. That is, your most recent job first. Don’t write what people call a “functional resume,” which lists skills (such as “management” or “financial analysis”) and then shows detailed accomplishments under each skill. People think that this format lets them highlight things that are most important, and this may be true. But the people who read resumes (and decide whether to interview you) hate this type of resume, because it is difficult for them to know when you did something. 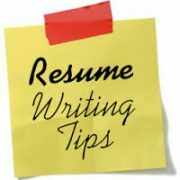 Remember – you are writing your resume for the reader, so write it the way the reader prefers. Be concise. Resume readers spend on average 6 seconds on every resume. (Yes, I said seconds). If you are early in your career, then keep it to one page. If you’re a bit more senior, then two pages are OK. As you move up, you can drop some of the details for your earlier jobs. (Don’t drop the jobs, just some of the detailed accomplishments). And don’t try to meet the one or two page limit by eliminating margins and using a tiny font. Include a brief description that covers size and business for each company. E.g. : “$1 billion software developer.” You can skip this if the company is absolutely well known, such as IBM or McDonalds. But don’t assume that everyone who reads your resume will have as much knowledge about your previous employers as you do. Include specific, quantifiable accomplishments. Your potential employer will find you much more interesting if you say that you “Led a marketing campaign that resulted in a 10% increase in revenue” than if you just say, “Led marketing campaign.” And if you managed a team, say how large the team was. From a resume reader’s perspective, it makes a difference if you were responsible for five people or 50 people. Don’t forget to proofread. This may be the most important tip! Grammar or spelling mistakes will eliminate you from consideration for any job. In case that didn’t sink in, let me say it again. Grammar or spelling mistakes will eliminate you from consideration for any job. So make sure that you have one or two friends proofread for you after you think it is perfect. And if you are a bilingual professional and English isn’t your first language, no matter how fluent you are, make sure that one of your proofreaders is a native English speaker. So, now that we’ve answered the questions, “What is a CV?” and “How to write a CV?” you should be ready to write your own CV / resume and go after your perfect job! Susan Landon, Managing Partner New York, Alexander Hughes Executive Search Consultants. https://redshoemovement.com/wp-content/uploads/2014/06/Screen-shot-2014-06-17-at-12.55.50-PM.png 193 295 Susan Landon https://redshoemovement.com/wp-content/uploads/2017/02/RSM-logo-website.png Susan Landon2014-06-27 13:12:352015-12-02 03:46:39What is a CV? Wonder no more! Achieve Work-Life Balance! Wonder Woman Is Dead Overcoming low self esteem – 6 things you can do now!